The supplies from the May issue of My Paper Pumpkin provided enough supplies to make four greeting cards and two gift cards with envelopes. The bottom two cards were “stepped up” by adding images from Traveler clear mount stamp set and Wanderlust photopolymer stamp set. The letter images for the banner shown on the top left card were obtained by using stamps from the vintage Designer Typeset Photopolymer set. Not familiar with My Paper Pumpkin? It is Stampin’ Up!‘s monthly creativity kit. It’s a surprise each month—anticipation for the surprise is seriously half the fun! 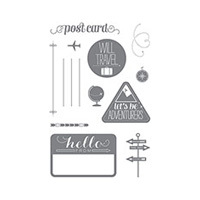 No worries, though, you’ll have everything you need to complete the project: paper, stamps, ink, accessories, and more! (You will need adhesive.) The kit also contains instructions and a visual guideline for suggested finished items. But no need to stop there… adding your own twist to the project makes it uniquely yours for sharing. Pinterest contains images of finished My Paper Pumpkin projects from the past year that will provide additional inspiration. The kit costs $19.95 plus tax (calculated when the order is placed). Shipping and handling is already included in the price of $19.95. Tried it when the program launched and decided it was not for you? As My Paper Pumpkin develops over time, the projects become more detailed and diverse (they are not always cards!). But, let’s be honest about the nature of this program. If you are an advanced paper crafter, these kits are not going to satisfy your expectations. My Paper Pumpkin is targeted toward the busy individual who does not wish to devote a lot of time to paper crafting, who does not wish an abundance of leftover supplies, or who cannot store the multiple items involved in creating a paper project from “scratch.” You will need your own scissors and adhesive (although the kits often contain sticky-backed cardstock that peels away for easy application as well as stamping dimensionals and glue dots). What supplies are not consumed entirely? Your first kit contains an acrylic block in addition to the kit supplies. That acrylic block will be used each month for stamping images. Each kit comes with one or two ink dots of various colors. Stampin’ Up! assures us that no color ink dot will be repeated within the year. These ink dots are easy to store and provides you with a source of ink colors for any future projects you might decide to try. And the photopolymer stamp images are unique to My Paper Pumpkin and will not be duplicated. Interested in trying it out? If you are local to me, I am inviting you to a monthly get-together at my house for the purpose of completing the My Paper Pumpkin project. Come by for social fun; beverages and snacks will be provided. I am targeting the last Monday of each month. This month’s date is June 30th, at 6 p.m. If you are already in the program for My Paper Pumpkin, then bring it to assemble if you have not already. Otherwise, I will help you sign up for the program and show you all the past projects for My Paper Pumpkin (MPP) and you can assist me in assembling my own MPP project. Have a friend who might be interested? Bring your friend along… the more, the merrier! I hope you consider My Paper Pumpkin. It really is a lot of fun and provides a source of handmade/crafted items to share. Additional information on options and costs is available under my blog’s header title My Paper Pumpkin at the top of this page. Also you will find answers to most commonly asked questions as well as sign up instructions here. If you need some help or have questions, please do not hesitate to contact me. I like your “stepped up” versions of these cards. My favorite is the Father’s Day card with the locomotive and the suitcase. It would be a perfect birthday card for my friend Felix who loves trains. Guess I have to move that stamp set up on my wish list. Thanks for sharing your creativity!